The Murat Centre, formerly the Murat Shrine Temple, is listed in the National Register of Historic Places. The building was constructed in three parts beginning in 1909 and when completed was to be one of the nations largest Masonic Shrines. It opened, with great fanfare, on February 28, 1910. The Murat Centre went through an $11,000,000 renovation that was completed in February 1996. Since its restoration the facility has played host to the biggest names in entertainment including Bruce Springsteen, John Mellencamp, Bob Dylan, Phish, Britney Spears, David Bowie, R.E.M., *NSYNC, Motley Crue, Sting, BB King, Harry Connick Jr, Jerry Seinfeld, Sesame Street Live, Carole King, Les Misérables, Miss Saigon, Mamma Mia!, The Phantom of the Opera, Cats, and many more. 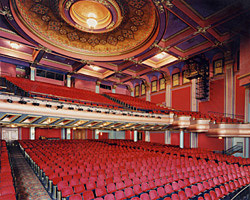 The concerts and national touring events are held in the Murat Theatre (capacity 2,500) or the Murat Egyptian Room (capacity 2,000 standing and capacity 1,000 for cabaret style seating). From the hieroglyphics of The Egyptian Room, to the high towers and turrets of The Murat, its rich history has once again become a scrupulous staple in downtown Indianapolis. The Murat Centre is "a peoples place" attracting people from all walks of life with the most diverse programming offered in the city of Indianapolis and central Indiana. Music by Claude-Michel Schönberg; Book by Alain Boublil, Claude-Michel Schönberg; Lyrics by Alain Boublil, Richard Maltby, Jr.
Music by David Shire; Book by John Weidman; Lyrics by Richard Maltby, Jr.